Darien (age 14) and Clifford (10) are Capt. Ron Denis nephews. 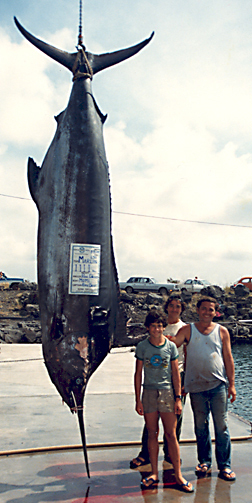 The marlin was attracted by a 100-lb tuna that they'd hooked on a bait and brought to their boat, the MOMI. The marlin circled the boat and they threw a rigged 4-lb tuna to it. The fish took the bait and the fight was on. Fight time was 11/2 hours.